More than 700 friends and neighbors visited Milk Source farms during our 2016 Community Compost Day. Swinging by in everything from pickup trucks to Amish buggies, our guests picked up thousands of bags and trailer loads of 100-percent-free, 100 percent organic compost. The event, in its sixth year, took place at Hudson Dairy in Michigan (picture above) as well as Wisconsin dairies at Rosendale Dairy in Pickett, Tidy View Dairy in Freedom and New Chester Dairy in Grand Marsh. The event seems to grow in size and enthusiasm annually, said Milk Source’s Director of Public Affairs Bill Harke. “We had a great time this year,” he added. Compost is the brown gold of gardening — 100 percent organic and bursting with critical nutrients for hungry spring flower and plant beds. 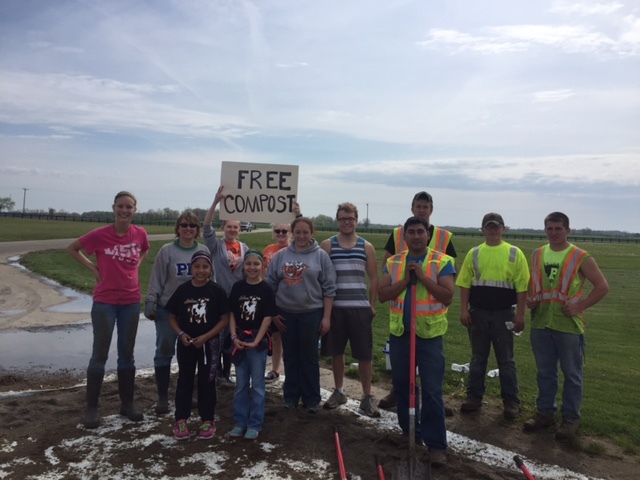 Milk Source worked with the University of Wisconsin-Oshkosh Foundation and BioFerm Energy Systems to provide biodigested solids at select locations, making a green event even greener.